Back working in Sonora in June, July, August, September, October, November and December of 2014, I started exploring the California Historial Landmarks in Calaveras County. Sites that I visited included: Valley Springs [#251], San Andreas [#252], I.O.O.F. Hall [#256], Fourth Crossing #258, Congregational Church [#261], Stone Corral [#263], Chili Gulch [#265], Jenny Lind [#266]; Mokelumne Hill [#269]; Pioneer Cemetery [#271], Douglas Flat [#272]; Carson Hill [#274], Robinson's Ferry [#276], Angels Camp [#287], Altaville [#288], Vallecito Bell Monument [#370]; Old Mining Camp of Brownsville [#465], Red Brick Grammar School [#499], Angels Hotel [#734] and Birthplace of Archie Stevenot [#769]. 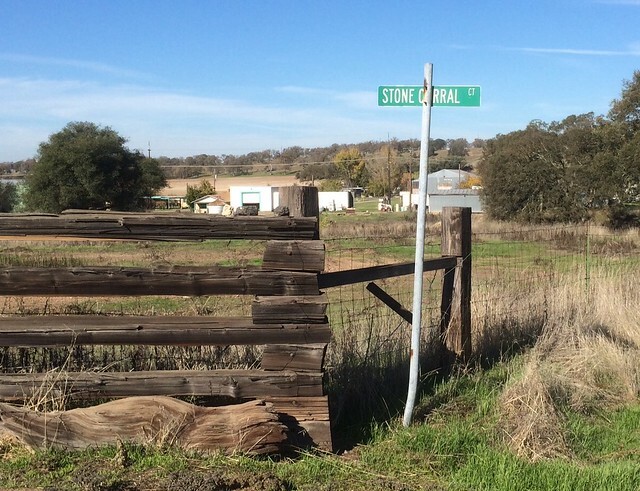 This landmark is located at Stone Corral Ranch, on State Highway 26, 9.5 miles southwest of Valley Springs, California in Calaveras County. There are 40 other California State Historical Landmarks in Calaveras County. The GPS coordinates for this location are N 38° 05'57.0" W 120° 55'35.7".